Biokleen Premium Laundry Powder (available here in Large Sizes) is their most powerful laundry detergent and offered here in their most economical sizes! 5lb 8 Packs, and 50lb Boxes. 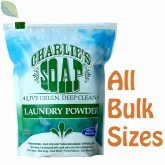 For each 5lbs, this Premium Laundry Powder offers 108 HE Loads / 54 Standard Loads (Use only 1-2 oz/load). 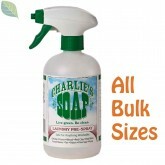 Additionally, plant based surfactants coupled with Enzymatic Stain Lifters and Oxygen Bleach double the cleaning power of Premium Laundry Powder when compared to Biokleen's Citrus and Free & Clear Laundry Powders, and Premium Laundry Powder rinses completely free of soap residue and hard water deposits, both primary causes of skin irritation and diaper rash. Cleaning laundry with cold or warm water. Premium Plus Laundry Powder is very concentrated. Use only recommended amount. For a laundry pre-treatment, start mixture at 1 ounce/quart. May increase up to 2 oz / quart max. For use as carpet pre-spray, mix at 1-2 ounces/gallon of water. Powdered detergents are almost always superior to liquids in effectiveness and concentration. Biokleen Premium Laundry Powder is similar to Biokleen's Citrus All Temperature Laundry Powder, with the addition of enzymes and more oxygen bleach. This Premium Laundry Powder is excellent as a Professional Carpet Cleaning PreSpray! In fact, it works as well as, or better than its main-stream, toxic professional counterparts, with obvious advantages. When used to clean carpets, simply dilute at 1-2 oz /gallon with warm or hot water. Then mix well, apply to carpet with a pump or Hydo-Force sprayer, and let dwell for 10 minutes or less. Finally, thoroughly extract with a hot water. Any remaining residue will dry to a crisp powder and will not leave the carpet fibers sticky. If necessary, hot water rinse again, or vacuum thoroughly once completely dry. Some customers have stated that when washing cloth diapers Biokleen Premium Plus Laundry Powder, a whitish buildup began to occur on the diapers liner. If this occurs, try washing with a vinegar rinse, or try switching to Biokleen Citrus All Temp Laundry Powder which contains less oxygen bleach and does not contain enzymes.